Совместный релиз Satanath Records и More Hate Productions: новый альбом "Proselytism" греческой doom/death metal группы Humanity Zero выходит 26 октября! 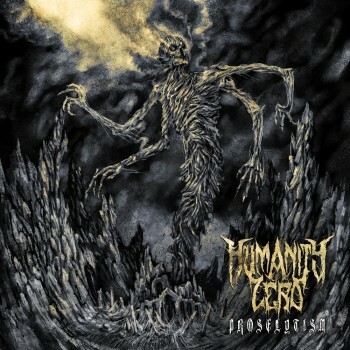 / Co-release Satanath Records with More Hate Productions: new album "Proselytism" of Greek doom/death metal band Humanity Zero is out on October 26th, 2018! Doom/Death Metal маньяки Humanity Zero из Греции возвращаются с новым альбомом под названием «Proselytism». Этот полноформат медленнее, глубже и атмосфернее любого другого из релизов HUMANITY ZERO. Восемь песен проползут через Ваш позвоночник, будут питаться Вашим здравомыслием и затащат Вашу душу в ядовитую яму тьмы. Тексты повествуют о кошмарных монстрах Космической Бездны из мира Лавкрафта. Настоятельно рекомендуется для поклонников Loss, Morgion, Ophis и раннего My Dying Bride. Обложка от Paint-It-Black Design. After “Withered In Isolation” doom/death hatemongers Humanity Zero from Greece return with their new full-length album entitled “Proselytism”. This album is slower, deeper and haunting yet more atmospheric and punishing than any other HUMANITY ZERO release. The eight obscure tracks will crawl through your spine, feed upon your sanity and drag your soul into the poisonous pits of darkness. Lyrically, “Proselytism” is a mandatory descend into the demented Lovecraftian demonology, a nightmarish praise to the sleeping Lords of the Cosmic Abyss. Strongly recommended for fans of Loss, Morgion, Ophis and early My Dying Bride. Artwork by Paint-It-Black Design.